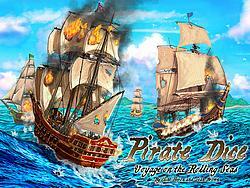 In Pirate Dice, you are the captain of a pirate ship, racing through the Caribbean against your fellow pirates. You must navigate the seas, obtain treasure, and return safely to your port. But beware, many hazards wait on the rolling seas, not the least of which are your rivals! You will need more than pure speed to win. Use your wits to block, ram, and fire at your opponents while doing your best to keep them from doing the same to you! Pirate Dice is a light but strategic dice game where players compete to be the first to find the sunken treasure in Treasure Cove! Will glory and fame be yours, or will you and your crew end up at the bottom of the sea ? Players roll and place customized command dice to pilot their ships around the sea. Commands allow ships to move, turn, fire cannons and even interfere directly with their opponents!